Using free appliqué patterns for quilting is an easy way to liven up your favorite quilt or throw. Blanket stitch appliqué: This style was popular in the late 19th and early 20th centuries and was used to give the quilts an "antique or folk-art flavor." This stitch resembles a blanket hand stitch. Invisible blind hem appliqué: Just as the name suggests, a blind hem is sewn to the design with invisible or monofilament thread. This stitch closely resembles a fine hand stitch. Fusible machine appliqué: This is probably the easiest of the appliqué stitches because it calls for using fusible material as a guide to create a lovely appliqué. This style allows you to iron the design to the quilt before sewing the edges. Free Appliqué Patterns lists many patterns that are available, but tells consumers that even though the appliqué is shown on a sweatshirt, it can be easily used on a quilt. Equilters has a great template of a sports shoe, as well as images of a finished quilt with the same design. Block Crazy has templates of animals, the moon and stars, Christmas and Celtic designs available. The average template size is for a six-inch quilt square, but can be reduced or enlarged to fit your needs. Quilting has links to various templates including patterns called Checkerboard Cherries and Winter Weekend. Store your appliqué patterns or templates in file folder or labeled envelope. It will be easier to find when you need it next time. If you choose to trace your appliqué pattern directly on to the fabric, do it on the wrong side so tracing lines won't show. Use a lightweight thread when appliquéing as to avoid any bulkiness, especially if you are using a stabilizer. Greeting cards and calendars can make great sources for appliqué designs. Old plastic placemats or milk jugs work well for cutting small appliqué templates. Glad Press 'N Seal or freezer paper is great for tracing appliqués as it stays in place without the stickiness from glue. 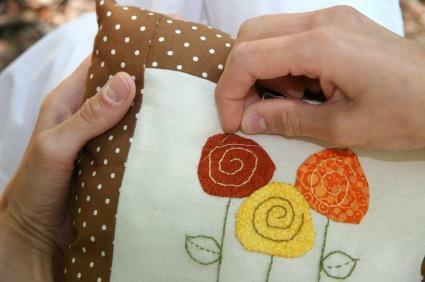 When first learning to appliqué, use a starched cotton fabric, as it is easier to use. When cutting a piece fabric around a appliqué template, leave one-quarter of an inch all the way around for stitching. You can always practice your appliquéing skills on an old quilt or throw you pick up at a thrift store or yard sale. While you are there, look around to see if there are any appliqué patterns available. They may not be free, but will certainly be cheap. Appliquéing a quilt can be a fun and easy skill you can learn as long as you have some basic sewing skills. Take your time and practice until you find the technique that suits you best.